Copenhagen, Denmark. CORTIME, a pioneer in making powerful design exploration available to a broader audience, is proud to announce that Soler & Palau has selected CORTIME for Design Optimization in SolidWorks. Soler & Palau was created in 1951 by the engineers Eduard Soler and Josep Palau and strives to introduce ever more efficient ventilation products and systems into the market that reduce energy consumption while protecting the environment. After more than 60 years in business, Soler & Palau ventilation products and services are available in more than 90 countries around the world. Soler & Palau has a simple goal and that is to develop an air-moving product that effectively and efficiently meets the needs of the customer, supported by continual in-house product development with state-of-the-art technology. The engineering team recently conducted a review of their design technology for opportunities to improve its effectiveness, prior to starting the next major re-design project on their ventilation products. After extensively researching available Design Optimization software packages, CORTIME was determined to be the best fit based on capability, cost, and software compatibility. CORTIME helps engineers explore optimal designs by automating their design evaluation process and exploring design options based on performance goals and constraints. CORTIME utilizes advanced parametric optimization, sensitivity analysis, and design study visualization to enable intelligent automated exploration of the potential design options. CORTIME is a certified SolidWorks Business Partner. Soler & Palau have used CORTIME to optimize one of their propeller designs by adjusting the pitch and radius of the blades. Ranges are applied to the variables to define the solution space, while instructing CORTIME to maximize the flow inside the vent. “CORTIME gives me new insight into my design that would be impossible to obtain manually. I will be able to make early decisions about my designs which will have a significant effect on performance, cost and time to market,” says Nick Thiessen Senior Design Engineer, S&P USA Ventilation Systems, LLC. CORTIME resulted in a reduction of 3.6 hours in human effort required for a simulation project with 9 configurations. Soler & Palau expects this to translate to approximately 130 hours in human effort saved yearly. In addition to saving time and effort Soler & Palau also anticipates additional benefit in having further optimized aerodynamic and structural designs that better serve their customers’ needs. CORTIME enables Soler & Palau to create better designs faster. CORTIME is the next generation design exploration tool leveraging advanced parametric optimization, sensitivity analysis, visualization tools, and an intuitive user experience that is fully integrated with SolidWorks. 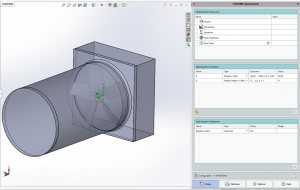 CORTIME addresses the need for a much simpler and more efficient way to optimize CAD designs. Their sole focus has been to minimize the learning curve, while still providing a powerful optimization engine. With CORTIME, Design Exploration is not just for experts anymore! Come by booth 228 at SolidWorks World 2019 to learn how CORTIME breaks the expertise barrier making Design Exploration broadly available for all SolidWorks users. CORTIME is a parametric optimization tool for SolidWorks. Founded in 2013, the purpose of the company is to help product developers become more effective in the design process. Currently, CORTIME is exclusively integrated into SolidWorks (including SolidWorks Simulation) but welcomes partners interested in integrating their software with CORTIME. Anyone with a SolidWorks license can experience CORTIME themselves by downloading the software at cortime.com.